If you’re not familiar with Cherry Hill’s work, you really ought to be. She and her husband, Richard Klimesh, have co-authored some of the most useful and informative books out there for horse owners. I own probably 10 or 12 of their books, and each one has terrific information, well-organized, well-illustrated, and sensible. There’s a school of horsekeeping thought that is all about the Ideal and the Perfect and then there’s a school that has well-thought out reasons for everything, takes workarounds into consideration, and gives you things to consider you never realized would factor in. Cherry Hill’s books are in that latter category. I have learned something every time I’ve picked up one of her books. 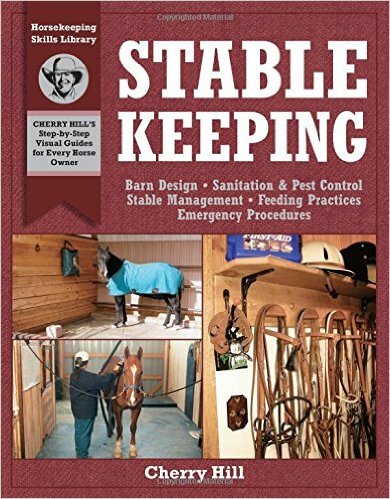 Learn to design and maintain a high-quality barn with this complete stablekeeping reference. Expert Cherry Hill draws on decades of horsekeeping experience to help you provide a safe, efficient, healthy living environment for your horse. Instructive text and more than 250 photographs cover topics such as stalls, tack rooms, work and storage areas, sanitation and pest control, feeding practices, safety, emergencies, and more. Even if you just board your horse, there’s something here for you to help your horse. And who hasn’t spent hours and hours designing their dream farm? Get more imagination fodder here. SO! I’m going to give away my extra copy of the book to a blog reader. You can enter via the Rafflecopter below. The giveaway will end on Friday, November 20. There are a bunch of ways you can enter the giveaway; pick just one or all of them. The easiest is to leave a comment on this blog sharing your best organizing tip for around the barn, in the spirit of the book. Good luck! Many years as a pony clubber has resulted in me being twitchy when things are not organized. I really, really love those little wire three-tier hanging baskets for keeping sponges and rags out of the way and in a place where air can circulate around them. It's not a huge thing, but having those in a central place (right in front of me) makes me wipe down my tack more often and results in less lost sponges or mildew-y rags. I'm also very into packing up the horses' feed in individual servings for overnight travel. I dump a serving of feed in a paper bag with any of the horse's powdered supplements, fold the top of the bag down, then tape it up and label it (e.g. “Moe 11/6/15 AM, 1 lb Safe Choice + 1 lb alfalfa pellets + SmartGain + SmartMuscle Mass). Then there's zero question about when to feed the horse or what the horse is eating. When I showed this to the horses' lesson kids for their three-day camp a couple of weeks ago, their minds were blown. Finally, I did not know you were on Twitter! Now I do! Hooray! I love all the trunks and racks and books! I love the $.99 plastic shoe containers. They keep the little things organized for not a lot of change AND they stack nicely. That is genius. And if they are indoors, they probably last forever. Stacking feed tubs changed my life (or at least my feed room)! I refuse to use anything else now. Would love to win this book! We are moving our horses to our own property at the end of this month and could use barn organizing ideas! My tip is to hang a home wire shower/bath organizer in the wash rack for storing shampoo, sponges, spray bottles etc – keeps things off the ground and water can drip off them without causing a mess.